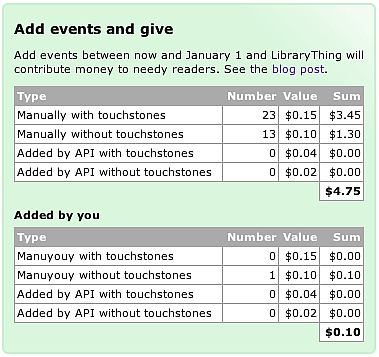 How should LibraryThing spend its money for needy readers? See the blog post. Suggestions welcome! Do we know if any libraries in New York or New Jersey lost everything during Sandy? Could we work toward rebuilding a few local libraries? So, the problem with US libraries is that most regular public libraries, especially in urbanized places like downstate New York and New Jersey, do not generally like book donations. Or rather, they'll take them, but they go into the book sale pile, not to be added as collections. Between that, disaster relief and considerable help from others, I feel like we're better off making a difference where books are much scarcer and the situation is always dire. It also makes it easier to motivate non-US members to contribute. Wonderful initiative. Not that many bookish events coming up that I'm aware of, but will see what I can do. My real location is easily traceable though, through my author page. p.s. : You forgot location for "local" can be totally different from location on profile? Schools are in desperate need for textbooks. I have teacher friends who have to pay for textbooks out of their own paycheck because there's no budget for them from the school board. How about targeting schools in need to encourage literacy at the root? One of my favorite charitable organizations is Donors Choose (www.donorschoose.org), in which public school teachers in low-income areas post classroom needs. There's a books category, and the projects include building classroom libraries, school libraries, and book projects for the classroom. 9> That's an excellent program. Sad that it's necessary for our schools to survive, though. A friend of mine who teaches in Los Angeles was able to get copies of Frankenstein for her class through Donors Choose. But she's also paid a considerable portion out of pocket for supplies, too. One that's on my radar because of its partnership with Better World Books is Books for Africa. They'll allow donors to target a specific project, and there is one in South Sudan (which was mentioned in the blog post). If you want an "actually donate books" charity in the US - in a place where the situation is truly dire, for Third World levels of dire - the Friends of the Pine Ridge Reservation has some lists of books needed for school libraries on the reservation. I rather dislike BW Books—they're NOT a charity. But Books for Africa looks good. 1. Give money to get the library started and/or staff it. 2. Send books to fill it. For #2, it's important the library be in an English-speaking country, or one with English as an official language, at least. I didn't mean to suggest they were, just that that's how I had heard about Books for Africa. > 13: I would even send money for something like that *. But I would suggest just giving them some kind of credit with any Amazon, or whatever, of their preference. Why limit this to English speaking countries, and why lump actual books around the world (more than absolutely needed to get them to said library)? * Could / should we create something like an LT foundation to handle that? (Easy for me to speak. I would gladly help out - I've served on the board of charities working in such countries as Sierra Leone, Liberia, the Philippines, Indonesia, etc. But I happen to live on yet another continent). If it's just money, fine, but if LibraryThing are to give their own books at all, their books are much more likely to be in English. Right. If this actually works—if people start adding events—then we're looking at that. But we're not going to do that unless this happens on a reasonable scale. It would require money and time. Right. Fully get you're not plunging into the deep without looking. As I said, wonderful initiative. Please let me know (PM or otherwise) if there's anything I could do. As for English speaking countries - don't get me wrong: I get that. If you're actually going to send physical books it absolutely makes sense. But that's why I think sending them credit to buy books might possibly be better. I'd give money. I'd give books. I'd never give Amazon credit. FWIW. > 19: Trying to hunt them down as we speak. So far without much luck. Has my part of the world gone to sleep? Sigh. It's soon Christmas. Surely it's signing season in the bookstores? "Your friends are correct that donated books are not wanted. We buy our books in library bindings. Regular bindings are not worth the time to process because they fall apart so quickly. A big publisher Simon & Schuster?? is donating lots of money for books, but more is always needed! I would suggest googling for small towns with school libraries hit hard and find out the librarian's name. Send the check with instructions that it can ONLY be spent on books chosen by the school librarian. If the school doesn't have a librarian, don't pick it! Smaller libraries, especially rural ones, will take donated books—go through them, not take them on no matter what, of course. Yes, the age old beggars vs. choosers thingy. I'm sure though (because I've been informed so) that the Dutch national library - within walking distance from where I live - covets a few of my "used books". (Still thinking about whether I should leave them to that institution when I pass on). In short: it's all about how easy it is to get the books. Nope. I've been adding events, and am finding that stores seem to have fewer events this time of year. I think they need the staff to concentrate on stocking the shelves and manning the registers. > 20: Right. Personally I don't do business with them either. That's part of why I said "Amazon, or whatever". (But I think my personal objections to that business are indeed personal. If it works for others: huzzah). Added by you: $ 0.10 - that's just depressing. (Appreciating the thought and effort though). #30-32: I'm feeling cranky today, so I get the joke, but I do not appreciate it. It's a joke? I don't get it. But I'm not cranky! Obviously, the money should be spent on the Occupy Wall Street Library. No offense to the "Occupy" people - the point is valid. But there are hundreds of thousands, if not millions, worse off than they are on this planet. There's no "obviously" about it. A million people worse off than the Occupiers? That's hard to imagine. Couldn't we at least send the People's Library a 55-gallon drum of hand sanitizer? Again: nothing against the "occupiers". I'm all for supporting them. But now take a look at things worldwide - people are starving in various countries, (civil) wars are all about us, and we manage to shoot missiles at each other. Mass hunger, genocide, etc., etc. This planet is not nearly as nice as it is sometimes pictured. I won't be giving through LT since I already give quite a number of books, around fifty or so thus far, to a young woman at my church who's currently in her second year of teaching (sixth grade) at an inner-city school in Philadelphia. I happen to read a good bit of middle-grade and YA books, so they're especially welcomed by her for her classroom library, and I don't as a rule give her "remainder bin" types of books. There's one book (One Crazy Summer) that I particularly "proselytize" and pick up an extra copy from time to time when I'm in a B&N. "Mrs. P-----," begins a wary student. "Well, um, I was reading the next chapter of our literature circle book and eating breakfast, and um ..."
"Well, I dropped it in my cereal bowl. It's ... kinda milky."
. . . from her posting on DonorsChoose, which has already been mentioned by a couple other posters and which seems to be a popular site. > 2, 3 If you want to donate to some place affected by the storm, the clinic at Bellevue Hospital in New York City participates in the national Reach out and Read campaign, which provides books to children from (mostly) low-income families. Unfortunately, the hospital suffered from Hurricane Sandy and they are now looking for monetary donations to replace the books lost. There was a PBS news story done prior to the storm on the Reach Out and Read program there, which gives you an idea of what the program does. There's also a link in there for where to send monetary donations. My favorite charity for donating (gently used) paperback books is Operation Paperback. Books donated go to U.S. troops on active duty, to the families of troops, and to veterans hospitals. I do this because I feel that's the least I can do for men and women who are putting their lives on the line in the service of my country. Are we going to have an option at the LT store to donate money? We already do, but maybe a special one for donations to this cause. Though I'm sure that if you'll earmark your donation, Tim wouldn't even think about using the money otherwise. Could we post a link? Well, I would rather hear from Tim / staff on that first. Wouldn't want to complicate things. Tim's an honorable man, but since the "donate" option wasn't explicitly created for this purpose. Plus I have no clue about American tax systems and all that. How about Books for Keeps located in Athens, Georgia? “Books for Keeps is a 100% volunteer organization and a 501(c)(3) public charity, so your tax-deductible donation will provide books that are given directly to children, for keeps. Send us a donation and we'll use it to change a child's future, 12 books at a time. I hope that at least the small amount of money credited to me will go to a country that is not one of the richest in the world. >51 MarthaJeanne: I have to kind of agree there. I know there are certainly people & places in the US with very low funds, but I feel Tim's original sentiment of "I feel like we're better off making a difference where books are much scarcer and the situation is always dire." (emphasis mine) is taking into account the larger picture and I would much prefer we help out where an entire country is lacking, and make more of a difference. While I'm not a huge fan of ebooks in general- or Amazon for that matter- I'm really intrigued by the idea of Worldreader, which was highlighted in a little article on Amazon here. Amazon has donated a bunch of Kindles to Worldreader which has distributed them to school children in Ghana, Kenya, and Uganda. While I would LOVE to see a physical library with tangible books in these areas, it's just not always possible. The idea of handing a child just about every book they could ever want in one fell swoop is kind of breathtaking. "There’s one thing that underscores everything we do at Worldreader: We want to make children in the developing world to fall in love with reading, and we do that by providing them access to an enormous selection of great books! Thanks to our partners Amazon.com, Random House Inc, Penguin Young Readers Group, Simon & Schuster, Longhorn Publishers, Smartline Publishers and dozens of other African and international publishers, our students have access to over 29,000 digital books." I am more of a fan of low-tech books, which are less likely to be broken, stolen, or lack electricity for charging. I am also cautious about only looking for the worst cases to help. Every act of kindness makes a difference to someone. Perhaps the children in the path of Hurricane Sandy do not experience want or deprivation to the extent of children in the Third World, but that in no way diminishes the distress they may be experiencing. Ranking troubles is troublesome. This whole thread makes me happy - LT and LTers, thanks for being there! I tend to agree with 54 above. We should do what we can to support public libraries in poorer sectors of the countries where LTers live. Question is, what do they actually want or need? Maybe it's infrastructure or software or public programs rather than books. We should be careful not to make the mistake of offering what we want to give rather than what is actually needed. I've spent some time in India, and I must say 1) books are far cheaper to produce there (black market) so it makes little sense to import; 2) in the cities there are book fairs selling box after water-stained box of used books that I think must get shipped as ballast or something - library discards, 1990s textbooks, cover-ripped overstock, etc. ; and 3) almost all the donated libraries I've seen are nothing but a sign - everything else has been stolen or was never put there in the first place but only created on paper in order to enrich some NGO/politician (read Katherine Boo's book! ); the only exceptions are run by religious organizations, but that has other problems. It might feel good to send books, ereaders, computers, etc., but the result is usually a disappointment unless there is very dense local organizing to support their use. What about supporting beleaguered writers via PEN (http://www.pen-international.org/ )? Giving out ereaders is giving out dependency—on electricity, on internet, on a proprietary platform, on DRM, etc. There's no "Ghana Kindle Store," and there would be legal problems selling many books there if there were. Also there is a big disadvantage with ereaders as compared to physical books. You give a physical book to a proper library scheme in Africa and that book will be read until it falls apart. Probably dozens of readers over the years. I'm not sure that would be the case with an ereader. I don't think that electricity is a problem. There is usually access to a generator of some sort even away from the main grids - after all a man with a mobile phone is becoming essential to village life in Africa. Your point about content is well taken - searching amazon.com for worldreader gives 546 hits. Plus I guess some Baen books and Project Gutenberg. However it does require a fairly high degree of knowledge about what is out there from the users. Another issue with ereaders that you haven't mentioned is fragility. How do they cope in an often dusty environment. What is the breakage rate like? As Nycticebus says you really do need some sort of organisation on the ground in the countries involved. The effectiveness of schemes often depends on country and engagement. However some of the main issues holding back reading culture in rural Africa is cost (books often cost as much if not more in some African countries as they do in the UK or US), and availability. Helping to create good village / school libraries will help with the availability problem but I think that requires more than just putting a load of discards on to a boat. Fortunately most of the bigger projects know this, and work with local partner organisations. #56 by timspalding> I won't beleaguer the point if everyone is against it, but cell phone use is WIDE spread in even the remotest parts of Africa now. eReaders which work on the same kind of signal and require the same kind of charging capabilities aren't really that much of a stretch in Africa any more. Now, their fragility may be a bigger issue, but I don't think the basic power and access is an issue. As for selling ebooks there, this is a bit above my information level but it seems to me that those publishers and sellers mentioned are going out of their way to make books available to these kids without hassle, which is pretty impressive. I'm right there with everyone else on ideally building a physical library because the allure of books in hands is amazing. This program just captivated me for the sheer volume of books and knowledge you can give at such a low cost and with no transportation fees/worries. > 58: Yes, that part of the idea is great. It's just that the whole e-book thing is still in its infancy. Lots of snags (technological, economic, and legal). I'm convinced these problems will be ironed out. We're just not there yet though. OldSarge's profile lists, in addition to Operation Paperback, Books for Soldiers. Haven't heard from OldSarge in a long time. Hope he's doing well. In the past he's spoken about how important books were to his men. Sorry, I do get your drift. And yes, of course American veterans deserve every credit. But if it comes to supporting veterans : I happen to be a veteran myself (just not US) and risked life and limb too, so in that case I'll choose to support myself. Not that I would begrudge them the dollars made through this project, but I would never donate. a South African perspective. a very good SAfrican charity concerned with reading, literacy and books is READ, this is an NGO aimed at supplying ill resourced schools with books, improving the skills of teachers to teach litracy and so on . this is specially important in rural areas. There is a website about their work and I see they are supported by the Roger Federer foundation . I am not involved in this organization at the moment, but woukd br my choice , but if anyone on LT would like to put questions I volunteer to find answers. there is a new report out from another NGO, CDE (centre for Development economics ) re youth unemployment in SA... It is a shocking situation with over 25 per cent unemployment and young unemployed figures hitting 40 per cent, this report argues that incomplete educations, poor educational levels leaves young people ill equipped to enter modern labour market in urban areas in SA . We have extraordinary contrasts between wealth and poverty,,, outsiders notice it immediately when visiting, a complex story of history and present challenges and very difficult to solve but I believe education and literacy are key elements in any solution. and of course the problem is urgent and feeds in to other social issues..eg Crime and lawlessness . another initiative of the City of Johannesburg Library is to put a set of encyclopedias into every school library in the city ... One sees encyclopedias now dumped and its crazy, as tho supercededby by Internet, are a source of knowledge and a resource for schools . so anyone wanting to support these two initiatives I can make the connections in Johannesburg. Now I have settled in to retirement and catalogued my own books I shall be involving myself in some charity work next year . A volunteer project has sent thousands of books to inmates in six Appalachian states. But it’s not as easy as some might think. MORGANTOWN, W. Va. — For people behind bars in six Appalachian states, they are one of the few forms of escape — hundreds of used books, wrapped in brown paper and stacked thigh-high under a table, just waiting to be shipped. VICKI SMITH / Associated PressOutreach coordinator Dominique Bruno with request letters sent to the Appalachian Prison Book Project in Morgantown, W. Va. The program has shipped more than 11,000 free, used books to prisoners. Parenting and self-help books. History and law. Dictionaries, biographies, and fiction. Whatever the subject, volunteers with the Appalachian Prison Book Project believe they hold the power to unlock worlds. From a small room in a historic house next to the Morgantown Public Library, they meticulously organize requests, exchanging letters to find just the right read and get permission from prison administrators while simultaneously scrambling to raise money for shipping. The process takes months, and the restrictions are many: Spiral-bound books are banned, their spines seen as potential weapons. Hardcovers are discouraged. Some institutions refuse books altogether, often with no explanation. For six years they have kept at it, shipping the 11,000th book last month. They have since sent dozens more to state and federal prisons across West Virginia, Virginia, Maryland, Ohio, Kentucky, and Tennessee. I think anything with a religious affiliation should be avoided for this puprose. Yes. It's simpler that way. The amount of money keeps going down (both for me individually and for the API feeds). I'm assuming that's because the events are going into the past faster than we can enter them. At this rate, we'll never reach the $1,000 or $5,000 limits. What gives? By the way, I'm finding that entering these events by hand is tedious and time consuming. I've done the ones I have out of love for LT. I'm finding this experience frustrating though. Just sayin'. I'll take a look. It shouldn't go down. The "now" should be the day it opened. Yes, really. The total sum was over $700 last time I looked. But I wonder whether it isn't weeding out duplicates rather than past events that is the cause. It hasn't gone down enough for past events to be the explanation, I think. Your own sum goes down? OK, that's another thing. My sum has behaved predictably. Have you double-checked so no-one has deleted any of the events you have added? I haven't checked if anyone has deleted my events. Today, it not only has gone down, it has also not gone up when I added more events. This is truly not worth my time! I'm sure Tim will find and fix the bug. Well, the total is still under $700, three days later. And my last two added events do not show up on my monetary contribution. So yep, this is broken. Neither does my last one. I added 50+ events Sunday, and not one show up in the table detailing my monetary contribution. If this is meant to encourage users in specific behavior I don't think it is working. In fact I think it is very embarrassing for You to start up a charitable initiative, and then not follow through and supporting the features that should show progress. This time of year SantaThing takes all of Tim's attention. It just has to get done in a certain amount of time and everything else has to wait. Yes. But. This particular thing was announced as a race against New Year's Day, so it's both time-critical and seasonal as well. I suppose the January 1 deadline could simply be extended for a couple of weeks. As always, there's no reason why SantaThing has to be such a crazy crunch; they could easily start it a couple of weeks earlier and relieve a lot of the time pressure. I know Tim wants to get back to this as soon as he can. SantaThing's a factor, but not a huge one this year, really - we've gotten it pretty much smoothed now and it went extremely well (knock on wood that things continue to go smoothly). We also have been getting Seth (our new sysadmin) started, and that has of course required quite a bit of Tim's time as well (but it's also meant some nice improvements, too). But he's still very much wanting to work more on this, and will be! I've added only a few local events... but where do I see the total $$ for my additions? Found it. Thanks for the link! It really bad style to start up such an initiative with a deadline, make a tally of the progress, and then not fix the tally when it breaks. This destroys all the goodwill you are trying to build up by arranging this kind of event. Amberwitch, Jeremy has already stated that Tim is very busy but will be getting back to this once he is able. Personally I find your attitude and complaints far more "destroying of good will" than Tim's getting caught up in other things for a few days. >87 .Monkey. : - oh now I feel all bad - not! Thank you for your oh-so-condescending reprimand, but I think I'll continue to complain as long as I like. Another organization I've been very impressed with (and donate through regularly) is globalgiving.org - if you put books in the search field, there are many book oriented projects needing funding. I'm looking at it. Does someone have a specific event they think didn't get credit? I'm signing in as you, Squeaky, to see if your recent ones are credited. entered since 11 / 20 / 12 @ 12:00:00am EST (unix time 1353391200). Of these, 64 are listed as having touchstones, 15 without. Besides these, you've added 973 events total (48 deleted). Do you think you've entered more? Do you think some have been mistakenly deleted? Do you think the touchstones have been declining somehow? Ah. Never mind. This was all addressed in the other thread ( http://www.librarything.com/topic/144884#3754523 ). I panicked when I saw a new post here, and failed to read the dates of Squeaky's messages. Anyway, the system's solid. They seem to be doing fine, Tim.